John’s Horror Corner: Exists (2014), found footage bigfoot folklore horror from the director of The Blair Witch Project (1999). MY CALL: This is pretty straightforward. It’s an unsubtle, action-driven, found footage film about some vacationers who stumble across bigfoot in the woods. 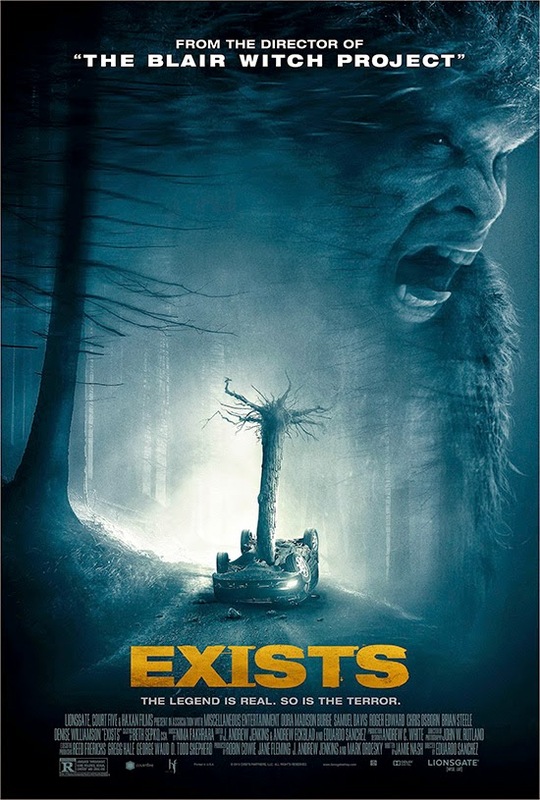 MOVIES LIKE Exists: I’d actually favor Willow Creek (2013; podcast discussion) when considering found footage or bigfoot films, and it does a better job of both. Unless, you want excitement, that is. Exists delivers constant excitement with empty characters whereas Willow Creek is a character-driven super-slow burn. For more folklore horror I’d direct you to Thale (2012), Krampus (2015; podcast discussion), Rare Exports: A Christmas Tale (2010), Trollhunter (2010; podcast discussion), The Hallow (2015; podcast discussion), Killer Mermaid (2014) and Leprechaun Origins (2014). Almost as soon as we push “play” things start getting weird for our protagonists after hitting “an animal of some sort” on their way to a cabin in east Texas. This film wastes absolutely no time (or tact) with subtlety. Just minutes deeper and we don’t just hear its howls, but we make frequent blurry sasquatch sightings. Despite the abundant evidence of a sasquatch (or several? ), this film starts out feeling rather boring. The characters aren’t interesting, the shaky shots of bigfoot aren’t really impressive (or effective), and I just don’t find myself caring about anything going on here. One bearded vacationer, rather certain from the start of a cryptozoological presence, remains ever prepared, filming everything in hopes of capturing evidence of this large-extremitied hominid. Meanwhile, everyone else doesn’t care or believe—they just want to have a good time. As things escalate in our opening act (i.e., the first 30-35 min) weak jump scares follow up lame pranks or party shenanigans, and the unsatisfying “action” is so abundant that no actual event ever really matters. But hold on…is this film about to take a turn for the better? Reminiscent of Ash’s twisted bridge marooning (Evil Dead 2), our bigfoot sabotages our survivors’ only way out—harpooning their car with a small tree. Bigfoot straight up Jason-Bourne-sprints through the woods in the most satisfying scene of the film so far! Later he gets a hold of one of the girls and it’s aggressively exciting and brutal, even if shaky and goreless, as he slams her ragdoll body around like Hulk whipping Loki. But what’s important to note here is that I think I’m beginning to forgive the boring first 30 minutes of this movie. After that stupid first act, this really picks up and becomes something fun! I’m not going out of my way to recommend this, but I must admit this ended up feeling quite worthwhile. This film toes the line between horror and Tremors (1990). It’s not nearly as funny (nor does it try quite that hard for comedy), but it relies more on raw physicality than actual scares, terror or tension. Things started out a bit dodgy and the characters were all weak, but director Eduardo Sanchez (The Blair Witch Project) pulled off an entertaining experience mixing feistiness and intensity. This sounds ok, I’m not usually a fan of found footage horror, but this seems worth a look. I certainly enjoyed it more than I thought I would. I’d like to see an actual Borne movie where Jason Borne is replaced by Sasquatch. Super clever Sasquatch always one step ahead of his enemies.